More so colorful holiday when you can vacation together with people you love. 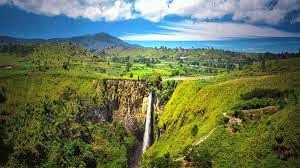 Sipiso Piso waterfall can be one of the main goals when you and your family vacation in North Sumatra. Me and my friends decided to vacation there. We start our journey from Kabanjahe, capital of Karo, North Sumatra. From Kabanjahe we move towards Sipiso-Piso using public transit for Rp. 10,000.00 per person with a travel time of approximately 45 minutes drive. Sipiso-piso name is derived from the word "Piso" which means the blade. This name was given because of the heavy flow of water-water that fell from the hill, with a height of over a hundred meters likened blades sharp. In addition, a steep ravine when viewed from the top of the hill make a local call from Tanah Karo Piso. You not only can see the waterfall from a distance. You can see the base of the waterfall with down hundreds of steps. But make sure you fit condition to do so because the steps are steep and do not forget to bring drinking water supplies. Fatigue down the stairs was lost, when you see the beautiful waterfall with a close distance. You can look in the direction of small hills that are before you. Your fascination of the high hills will be coupled with a roar splash thousands of water droplets bouncing off the water fall point. Lodging can be found in the village Tongging or Kabanjahe City, the capital of Karo. You can also buy a memento / souvenir Karo in the tourist area Sipiso-Piso waterfall.